Even as the demand for waterproof socks gradually hits crescendo; the supply is equally scaling the tip-tops. The skyrocketing supply has created a situation where buyers are unable to narrow their search down to a single product. 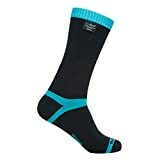 And yes, as the market slowly shapes into a battle of the bulge with every manufacturer fighting tooth and nail to out-muscle their competition; buyers might have to scratch their heads even more before stumbling on the best products.Fortunately, after flexing muscles and keenly sifting through every available product, I was able to unveil the top 10 best waterproof socks this year. Before we look at them, let’s take a glance at some of the factors you need to consider in order to sieve out those half-baked products and remain with the picks of the bunch as your residue. Fortunately, after flexing muscles and keenly sifting through every available product, I was able to unveil the top 10 best waterproof socks this year. So here is the list! Starting us on the 10th position is the Dexshell Thermlite socks. It’s one of the best products on the market; of course, Dexshell is a big name! Made of 96% abrasion-resistant nylon, 1% elastic and 3% Elastane, there is no doubt that it’s a must-have product for any hiking, kayaking or fishing enthusiast. Its Porelle waterproof and breathable membranes give it an outstanding waterproofness while the inner merino wool which takes up like 38% of the total interior offers adequate durability. The 24% anti-pilling acrylic ensures that you don’t have your sock getting peeled off after a single wash. What’s more, its excellent moisture wicking ability makes it quite outstanding and reliable. It’s quite versatile; can be used for various activities like fishing, kayaking, and mountain climbing. Its waterproof liner may delaminate after some time. Lifemall UMM 3MM waterproof socks come in on the 9th position. Of course, these are socks we are all conversant with; or at least a large majority has used it. 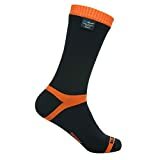 Although I wouldn’t recommend these socks for summit climbing given their thickness, they keep your feet warm in the cold season, prevent chafing and add an extra insulation. They come with an anti-slip and tightened Velcro buckle for closure thus ensuring that you don’t have to worry about your socks moving downwards as you engage in your activities. 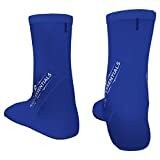 These wetsuit socks are designed to keep a layer of warm water between the cold water and your skin thus keeping your feet warm and toasty throughout. With the Velcro closure, coming out in the water is impossible. The tough neoprene fabric protects against sharp objects, cold and sand. It offers adequate comfort to your skin. That’s not all they do; they are mild calf length socks which not only offer unmatched comfort but also deliver unrivaled breathability ensuring that your feet remain in tip-top condition even when exposed to water. If you’re one of those people whose legs become sources of extreme odor when exposed to water for a while, then these are your number one companion. The merino wool piles offer adequate insulation. They boast unsurpassed wicking performance. They aren’t the cheapest on the market. Made from 80% cotton, Dexshell Ultralite socks grab the 7th position. Lightweight, they are made with a PU coating fabric for utmost comfort. And yes, the water resistant reflective zipper offers total waterproofness ensuring that your feet are not only warm but also exceptionally dry even when you go through wet environments. The top quality cuff bands which are fully elastic ensure that your feet snugly fit without the issue of the socks moving downwards as you move. The silicone grippers add to its extremely high-quality design to offer a slip-free fit all around your leg. If you’re looking for waterproof socks whose quality is top tier, then you can trust these ones to work wonders. It’s completely waterproof and shower-proof. It comes with an open sole and nice Velcro straps to offer a snug fit to different brands of cycling shoes. It offers extreme abrasion resistance. It loses its waterproofness after numerous washes. Dexshell Cosolvents are waterproof mid-calf socks which are highly breathable and extremely reliable. Their inner lining offers antibacterial moisture transfer while mid-weight FX yarns ensure that your feet are properly protected from any form of abrasion. The antibacterial lining keeps infectious bacteria at bay thus protecting you from fungal infections. The terry loop cushion pad which runs from the toe all the way to the heel offers adequate support and comfort anytime you are engaging in strenuous activities in eater-filled environments. It protects your feet from fungal infections. It’s ideal for those with smelly feet. They tend to roll down after several uses. Randy sun Unisex waterproof socks which are made from 74% nylon, 23% Lycra and 3% Elastane offer incredibly impressive waterproofness. They are not only waterproof but also adequately breathable to ensure that your feet are not only dry but also sufficiently aerated. The lightweight, waterproof and breathable membrane with a lining made of 3% Lycra, 33% Elastane and 64% Coolmax ensures that you stay comfortable and adequately protected from water and micro bacterial agents. With small, medium and large sizes, it offers an opportunity for everyone to share in the joy and comfort while the fact that it’s unisex makes it even better for everyone. It’s specially designed for harsh and extreme sporting activities. The antibacterial function offers an adequate reduction of bad odor. It can be hand washed under normal temperatures. The waterproofness only works for some time. These weatherproof premium socks not only keep your feet comfortable in rainy and wet environments but also keep them in a perfect condition even in hot times. 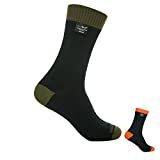 Made using numerous materials combined in appropriate proportions; these waterproof socks are a must-have for anyone who has issues with bad odor. 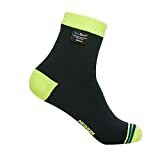 The combination of acrylic, polyester, wool, cotton, rubber, and spandex in 46%, 20%, 16%, 13%, 3% and 2% respectively gives these socks excellent moisture wicking and arch support properties. The fully cushioned footbed with comfortable toe seams and durable fabric completely erase the word “disappointed” from your dictionary. In a jiffy, these are socks which will not only keep your protected from the cold weather but will also ensure that you’re fully comfortable in the hot environment. They have excellent temperature balancing ability. They are ideal for numerous sizes. The combination of various materials makes them quite reliable. From this point, the list turns into a three horse race where competition becomes even stiffer. Nordic Essentials’ waterproof socks open up the top three positions. These are beach socks which can be worn as you engage in any beach sporting activities like volleyball and soccer. They boast some of the greatest accessories which are thrown into the bargain to ensure that your feet remain comfortable and extremely safe and secure from bacterial and fungal infections. They are weatherproof; of course, you know what that means. They can be used in both warm and cold weather conditions without causing even the slightest discomfort. And yes, they also come in varied sizes to ensure that every member of your family is well protected when you’re out there having fun at the beach. They are quite versatile; they can be used for swimming, diving or surfing. They can be used with fins and booties for proper protection. The bottom pad isn’t hard enough. NeoSport Neoprene which boasts 2mm of thickness comes in on the second position. These waterproof socks are the perfect solution for using full-foot fins and are great in cool conditions where water is a bother. They come with an EZ slip-on design which makes them quite convenient. Of course, this design makes them quite handy and reliable. Although they are ideal for cold weather, they can also be used in warm conditions. They are the solution for use of full-foot fins. The socks are a little loose. Finally, Seavenger waterproof socks which are made using a super stretchy and extremely comfy Lycra material take the first position. They come with an adjustable ankle cuff which makes them ideal for people with varied foot sizes. Their tough Neoprene sole makes them extremely sturdy and sufficiently comfortable for extreme sporting activities. If you’re looking for socks which will stand the scorching summer climate, you can trust these socks to offer more than just comfort. Of course, given their unique design, they’re ideal for pooling, snorkeling and beach combing. They are built for top tier quality. They are available in various sizes for everyone to share in the fun. They are designed for various activities. They seem to run a little bit small. If you want to take the crème de la crème home, you have to ensure that you place waterproofness as you first consideration. Of course, the word ‘waterproof” in the name “waterproof socks” isn’t a decoration or some useless prefix meant to make the name longer. The word “waterproof” implies that the socks have to inhibit water from getting to your feet. For that reason, you have to take it upon yourself to test and calculate the duration within which the socks can stop water from affecting your feet. And, of course, the time should be reasonable. The material used in the construction of waterproof socks affects how sturdy and durable it becomes. It’s prudent that you take note of the material used before making a purchase. This will spare you the headache of having to make returns later after experiencing numerous disappointments. Neoprene is the commonly used material which is reinforced with waterproof covers to bring in the aspect of the socks being waterproof. However, we have some so-so products whose construction is inferior thus translating to poor performance. In a jiffy, take note of the material used; don’t just pick blindly! The activity you intend to engage in should also affect your choice of waterproof socks. We have heavy and warm waterproof socks while we have others which are light and cool. Depending on the activity you intend to use them for, it’s advisable that you select your socks wisely to avoid getting disappointed. I think I should have placed comfort as the number one priority. Without comfort, I doubt if anyone would be willing to engage in any activity. This means that you have to ensure that you go for the waterproof socks which secure your feet while at the same time keeping them comfortable. We cannot overlook the price; no matter where we look at the issue from. The old adage “Cheap is expensive” seems to hold waters to date. For that reason, if spending a few more bucks will save you the hassle of frequenting the market looking for replacements; then I’d advise you to do it. When looking for nice waterproof socks, you have to do a thorough screening of every available product. Given the options listed above, simply grab one of them and have yourself toasty, warm and dry feet in all-weather conditions.